Everyone loves summer: clear blue skies, long days, and the sun shining brightly. But sometimes the heat is just too strong, and what would’ve been a beautiful day to go to the park turns out to be a sweaty, sitting-on-the-couch, blasting-the-air-conditioner kind of day. On days like these, what’s better than keeping everyone cool and entertaining your kids at the same time? We found 7 fun ways to keep kids cool when summer heats up. There’s nothing better than a cold popsicle on a super hot day. Instead of just freezing juice, test out these cool DIY popsicle recipes! 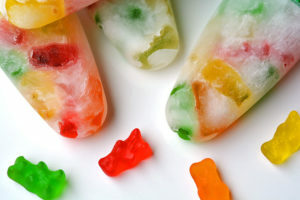 This one from One Little Project is made of gummy bears and Sprite, and this ice cream popsicle bar from Jacquelyn Clark is perfect if you love cookies & cream. If you don’t have a popsicle mold, try out Got Chocolate’s chocolate covered frozen banana – it’ll be fun for kids to pick out their favorite toppings! If your kids want a game to play with their friends, this water balloon baseball from Overstuffed is the perfect solution. 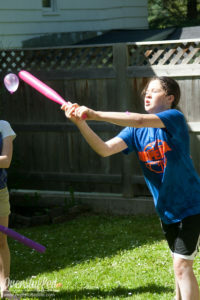 Fill up water balloons, grab a wiffle bat, and let the game begin! Kids will get splashed and have fun competing to see who can hit the most balloons. A modified version of this, if your kids aren’t baseball fans, would be to hang balloons with string and have the kids play piñata with water balloons. This is a mess free, cost free activity for the artist in your kids. You might have some old paint brushes and rollers lying around, and then all you need is a bucket of water! Happy Hooligans’ version suggests that kids try covering the entire fence before it all evaporates, or they can take a more creative approach with some pictures/words. Bless My Weed’s take on a traditional carwash might take a little more setup, but the result will be well worth it. 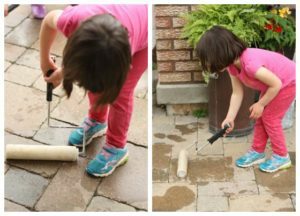 Her backyard kidwash requires PVC pipes, sponges, and tarps. There’s room to be creative with setting it up, and your kids can help build it. This will definitely keep everyone cool! If your kids are crafty and like to design/build, this is the perfect summer activity!. Basically, you use zip ties to secure different items to a peg board, and pour water down your path. Teaching Mama made a pool noodle water wall, which is cool because you can race marbles down the noodles. 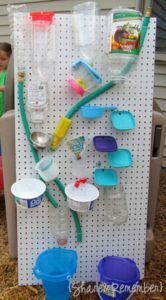 You can also take inspiration from Things to Share and Remember’s recycled-objects water wall. Hers is made of tons of random old plastic containers you might have lying around. It’s totally hands on and there are no rules — just have fun with it! 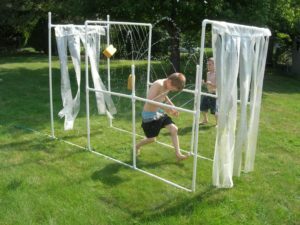 This Grandma is Fun reinvents the classic squirt gun carnival game in her own backyard with these squirt gun races. 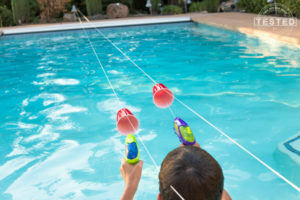 All you have to do is hang 2 cups from string around your backyard; across the pool makes the race more challenging, and makes kids jump in the cold water. Kids can race each other pushing the cups all the way to the end of the course using only a water gun. Kids love this popular app, and now they can play it in real life! 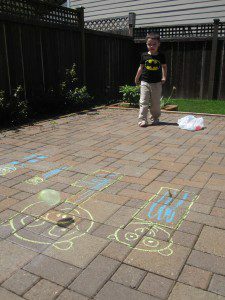 No Time for Flashcards created this water balloon Angry Birds game with her son. It couldn’t be simpler: draw out some pigs in chalk, fill water balloons, use a sharpie to draw on angry bird faces, and fire away! This game will be entertaining and beat the heat for sure. Need ideas for indoor summer camps to keep kids busy and cool? Shop ActivityHero to find camps near you now.